HONEY AND HEMLOCK: 1971 Animated Version of "A Christmas Carol"
A Christmas Carol (1971) is a 25-minute animated cartoon adaptation of Charles Dickens' book which was originally shown on Dec 21, 1971 on ABC television in the United States. 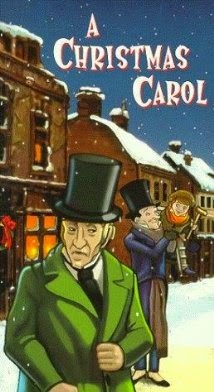 Originally produced for television in 1971, A Christmas Carol was recognized for it's excellence and nominated for an Academy Award... but there was a problem. Only films shown theatrically were eligible. So, the short was released briefly in theaters to make it eligible! It went on to actually win an Academy Award for best animated short subject in 1973; it remains the only film adaptation of the story to date to be so honored. However, some industry insiders were unhappy that a short originally shown on TV was awarded the Academy Award, which led to the Academy changing its policy, disqualifying any shorts that were shown on television first. This adaptation has a distinctive look, created by multiple pans and zooms and excellent scene transitions. It also was largely inspired by John Leech's illustrations for the original edition of the novel A Christmas Carol. Alastair Sim, Michael Hordern and Mervyn Johns reprise their roles as Scrooge, Marley and Bob Crachit from the classic British film version of A Christmas Carol. The dark and atmospheric scenes make it perhaps the scariest adaptation ever made! Many kids that saw it have not only fond memories of it, but also relate how frightening some of it was to them. Which is how it should be in any effort that tries to remain faithful to the original story. To date, it has only been released on VHS video (which are now going for over $200 on Ebay). Hopefully, this classic short feature will soon be released on DVD for those who remember it, and for a whole new legion of fans!